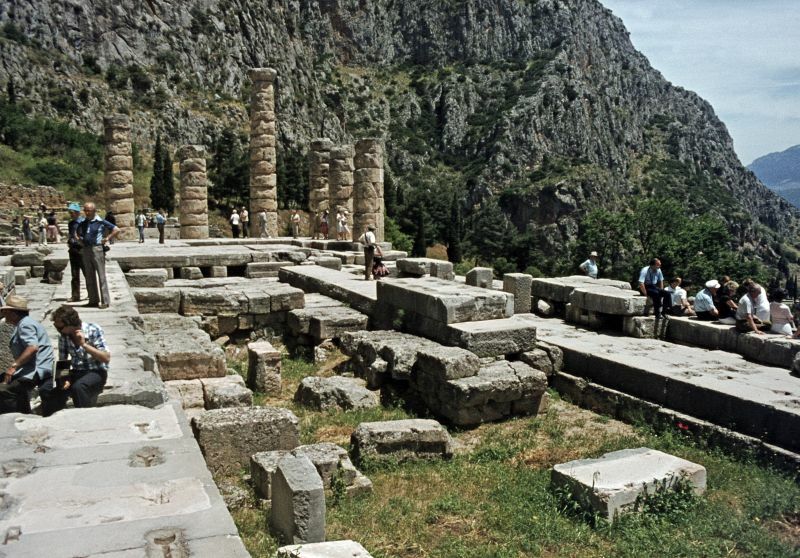 Delphi, Greece, visited in 1978. The temple where the oracle was located. Delphi’s compilers use their own Object Pascal dialect of Pascal and generate native code for several platforms: Windows NT (IA-32 and x64), OS X (IA-32 only), iOS and Android. Delphi was originally developed by Borland as a rapid application development tool for Windows, and as the successor of Borland Pascal. Delphi and its C++ counterpart, C++Builder, shared many core components, notably the IDE and the Visual Component Library (VCL), but remained separate until the release of RAD Studio 2007. RAD Studio is a shared host for Delphi, C++Builder, and others. In 2006, Borland’s developer tools section were transferred to a wholly owned subsidiary known as CodeGear, which was sold to Embarcadero Technologies in 2008. I have followed the Delphi upgrades up till Delphi 7, aimed at Windows XP. The price became too high after that version. It still runs (with some help) on current Windows versions. ← Pascal like languages still relevant?